Twitter gets lots of grief from investors because it hasn't taken over the world the way Facebook did, at least in terms of amassing users. But maybe it's destined to stay small, serving a vital, if limited, role for the public. Maybe Twitter just isn't meant to be an all-encompassing social utility. Maybe stock price is not the only lens through which a company can be valued. Twitter, perhaps even in spite of its difficult interface and site-specific lingo, has become a cultural force since its 2006 founding. "I don't think at this point Twitter is ever going to reach the size of Facebook and I don't know if that necessarily matters," says Debra Aho Williamson, an analyst at research firm eMarketer. Assuming, that is, that Twitter can figure out some way to make money off people who read tweets but don't ever log into the service. Things got no better on Tuesday, when Twitter again reported largely stagnant user figures — 310 million, up from 305 million in the fourth quarter. (The company had previously reported 320 million users in the fourth quarter, but it has changed how it counts them). This makes Twitter less than one-fifth Facebook's size. It can't even brag about being larger than LinkedIn, its more buttoned-up (and buttoned-down) professional networking cousin. While Twitter's per-share earnings beat Wall Street's expectations, revenue fell short. Revenue grew 36 percent to $595 million from $436 million a year earlier. Analysts polled by FactSet had expected $607.9 million. 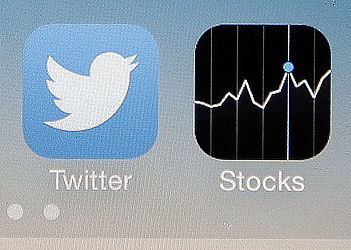 Twitter's already-clobbered stock fell $2.28, or almost 13 percent, to $15.49 in after-hours trading. Ever since returned to helm the company he co-founded in 2006, CEO Jack Dorsey has insisted that Twitter needs to work harder at both attracting new users and giving occasional visitors more reasons to check back in. To date, neither has happened. Yet Twitter has a firm hold on the public consciousness. Even non-users are at least aware of its existence, if not totally up to speed on its purpose. The Pope is on Twitter; so are President Obama and Beyoncé, along with a cadre of lesser celebrities. Unlike Facebook, a place for friends, family and near-forgotten grade school classmates, Twitter is a great place to follow actors, soccer players, late-night comedians and newsmakers to feel like you are in the know. "Twitter's problem is that the management does not understand what they have," said Wedbush Securities analyst Michael Pachter, who argued that the company is still failing to retool itself for new users. "I didn't know you could mute somebody," he said. "How did I not know that?" Another frequent complaint involves Twitter's somewhat arcane 140-character limit, a relic of its early technology. To get around the limits, users have taken to posting screenshots of longer blocks of text. Dorsey has hinted at expanding that limit, even tweeting a 1,325-character message — as a screenshot — on the subject back in January. So far, the limit remains unchanged. Then there's the Twitter lingo, from hashtags to "at" symbols and the like. If Twitter wants to attract more grandmothers, it'll have to lose the text-speak. Pachter called Twitter a "great product" that has gotten to where it is in spite of, not because of its management. The users that have stuck around — all 310 million of them — have overcome obstacles such as poor interface, search and, he said, a "terrible functionality." For the current quarter, Twitter forecasts revenue of $590 million to $610 million, well below analysts' expectations of $677.7 million. The company said it is expanding its advertising program to logged-out users. It's currently testing the ads for people on desktop computer, who make up a small slice of its user base. This quarter, the ads are coming to mobile web users who are not logged in to Twitter but still read it.